Last week I was at Trader Joe’s and I was STARVING. A bad combination. So of course I couldn’t help veering off my shopping list and buying their mini peanut butter cups. 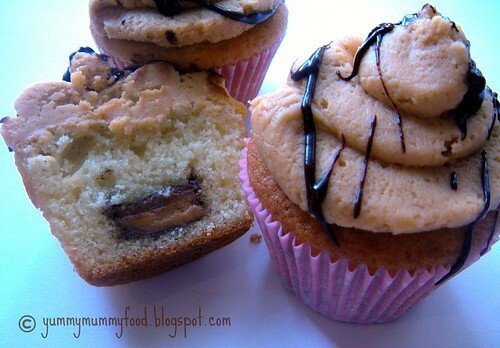 As I was making the Tiramisu Cupcakes, I decided to drop one of the peanut butter cups into the cupcakes and top them with this peanut butter frosting (a Barefoot Contessa recipe) I had used on chocolate cupcakes before. I have also submitted this recipe for a bake-off on a darling blog called Summer’s Cakes! Preheat oven to 325 degrees. Line a muffin tin with cupcake wrappers. Sift the flour, baking powder, baking soda, and salt into a medium bowl and set aside. In a large bowl, using an electric mixer on medium speed, beat the egg and yolk and sugar until thickened and lightened to a cream color, about 2 minutes. Stop the mixer and scrape the sides of the bowl as needed during mixing. On low speed, mix in the oil and vanilla until blended. Mix in the sour cream until no white streaks remain. Mix in the flour mixture until it in incorporated and the batter is smooth. Drop some batter into the muffin cups. Place one peanut butter cup on top. Top with the rest of the batter, so that the cups are about 3/4 filled. Bake 20 minutes, or until golden on top and a toothpick inserted into the middle comes out clean. Cool. Melt chocolate chips in a double boiler or heat in microwave on short intervals stirring between them until melted. Drizzle chocolate over cupcakes with a fork. Those look amazing!! I have a sun that is allergic to peanuts (and eggs). 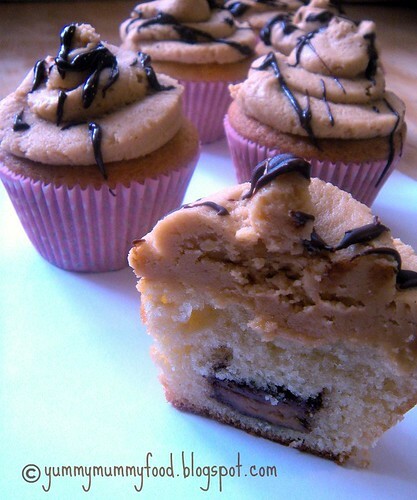 So any recipe that calls for peanut butter looks even more amazing! those looks delish!! mm I wanna try them real bad 🙂 thanks for sharing! We are having a few bake sales to raise money for Unite for the Cure and I think I will make these! They look so good! today known as Reese's peanut butter cups.